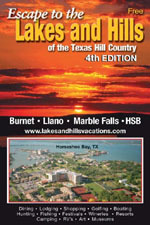 Lodging - Lake Marble Falls, Marble Falls, Spicewood, hotels, bed & breakfasts, resorts, cabins, rv sites and other lodging information in the Texas Highland Lakes area. Located in the Heart of the Hill Country, Hampton Inn on the Lake is just minutes from lakes, fishing, golf, wineries, & walking distance to restaurants & shopping. Hampton Inn on the Lake is the perfect place for your lodging & meeting needs providing guests with a full complement of services & amenities. Highway 281 & Ollie Ln. "America's original pet friendly motel chain, welcoming travelers and their pets since 1962." of Llano County B&Bs, Cabins & Cottages, Motels & Hotels, Hill Country Ranches & Vacation Rentals on the Llano River, Lake Buchanan, Inks Lake & Lake LBJ. Check out our listings and spend your next vacation with us! 281-723-6279 Situated on the banks of Lake Travis, you will find Bella Vista Bed and Breakfast. The guest house offers 3 individual rooms with private bathrooms and private patios. The Cowboy Cottage is a 2 bedroom apartment, perfect for families or those wanting a bit more privacy. the beautiful countryside offers a peaceful retreat with the convenience of location near Marble Falls, Horseshoe Bay, shopping, dining, nature parks and area events. Amenities: Pool, Flat Screen TV's and DVD Players, Free High Speed Internet, Refrigerators & Microwaves in all rooms. Complimentary Breakfast. 512-755-4028 Our mission at Creek Side is to provide a place for you to rest, relax and rejuvenate. We want you to have fun doing it! God has blessed us with this beautiful spot on Hamilton Creek and we want to share it with you. Our goal is to make Creek Side a place that you feel pampered and special. We offer cabins and a few tent sites on the creek. Type: Hotel - The Hampton Inn On the Lake is the perfect place for your lodging and meeting needs providing leisure and business guests with a full complement of services and amenities. Our lakeside hotel offers many unexpected amenities to provide an enjoyable relaxing stay. This newly constructed property opened in March 2010. The Motel 6-Marble Falls is the newest jewel of the Highland Lakes / Texas Hill Country, and your stop for economy lodging.,,With a bold new look, a chic feel, it is still the lowest price of any national chain. Located off Highway 281, our 100% smoke-free facility has wood-effect flooring, 32" flat screen HDTV's, a redesigned modern bathroom, free expanded cable as well as free WiFi and wired internet.,,Corporate and Extended Stay Rates are Available! Our mission at Creek Side is to provide a place for you to rest, relax and rejuvenate. We want you to have fun doing it! God has blessed us with this beautiful spot on Hamilton Creek and we want to share it with you. Our goal is to make Creek Side a place that you feel pampered and special. We offer cabins and a few tent sites on the creek. The largest Off-Road Park in Texas. Come play with us on our 3,000 acre park and ride over 200 miles of trails. Hidden Falls also offers Paintball, Shooting Range, (18) RV Sites w/Hook-ups, Campsites, horseback, hike and bike trails. Amenities: Gated Entry, Boat Launch, Wireless Internet, Paved Interior Roads, Boat Slips, Cable TV, Premium Waterfront Sites, Swimming Area, On Site Management, Concrete RV Pads, Fishing, Coin Laundry, Big Rig Sites, Picnic Area, Park Store, Monthly RV Site Rates, Picnic Tables at Every Site, Family Style Restrooms & Showers, 58 RV Sites with 3-way Full Hookups, all 30/50 amp, Card/Game Room, Lakefront Meeting Room w/ Kitchen, Seats up to 50.